Are you ready for February? January is almost gone and now is the perfect time to make a plan for the next month. 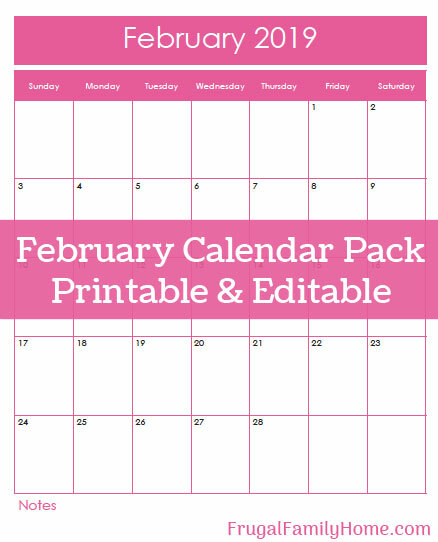 Make your plan for February using these free printable February calendar pages. They editable too. Grab a copy of the free printable calendar pages below. It’s a pack of two calendars, one is vertical and one horizontal. But what’s great about them is you can edit them before you print. I like to have a vertical and horizontal calendar page because it’s nice to use them for different tasks. I use a horizontal calendar page for meal planning and display it on the refrigerator. You can use the vertical printable calendar page in your homemaking planner. Or print one out for your kids to use for tracking their homework or chores. This February calendar pack can be edited before printing. This means you can type in on each day your plan and then print it. So you can more easily read it. So you can make your full meal plan for the month and then print it. Or type in the kid’s chores and then print. I hope it helps to keep you make a plan for the month of February. If you like planning sheets take a look at my homemaking planner. It has lots of sheets to help keep your days organized one page at a time. If you’d like to see what’s included in the homemaking planner you can click this link to head over to see each of the pages included in the full planner. Don’t forget to add your plans for Valentine’s day to the calendar. Maybe drop a few hints to your honey too. What fun things do you have planned for this month?